How sanctions went from punishment to status quo in America's shadow war against Iran. The United States and Iran have never been at war, but by imposing unilateral sanctions, the U.S. has long wielded money as a weapon in a shadow war that’s been raging since 1979. In what was called a momentous foreign policy move of Donald Trump’s presidency, the president announced on May 8, 2018 that he was withdrawing the United States from its 2015 nuclear accord with Iran. The end of the nuclear deal meant a new beginning for economic sanctions against the country—sanctions that, over the decades, have cratered Iran’s economy and destabilized relations throughout the Middle East. The history of American sanctions against Iran began with a bang when a group of Iranian students stormed the American embassy in Tehran on November 4, 1979, taking more than 60 United States citizens hostage and sparking an international crisis. 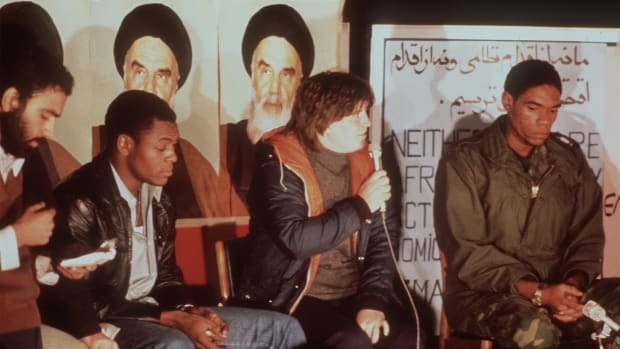 The 444-day-long hostage crisis hobbled Jimmy Carter’s presidency, ushered in a new political era for Iran, and helped skyrocket Ayatollah Ruhollah Khomeini, a revolutionary cleric who objected to United States interference, to international significance. It also created a state of permanent deadlock between the U.S. and Iran—a tense standoff characterized by a pattern of sanctions over direct negotiations. VIDEO: Iran Hostage Crisis Explore the chain of events that set off the Iran hostage crisis – an diplomatic standoff that would keep Americans on edge and shape the course of Jimmy Carter’s presidency. President Carter swiftly imposed sanctions on Iran after the hostage crisis began, cutting off sales of Iranian oil and freezing Iranian assets. These measures did nothing to help along diplomatic negotiations for the release of the prisoners, so on April 7, 1980, 212 days after the crisis began, he announced even more drastic measures. The U.S. cut off diplomatic relations with Iran, imposed economic sanctions including cutting off food aid, closed Iranian institutions within the U.S., and embargoed all imports from Iran. They didn’t. As the hostage crisis continued, Carter okayed a disastrous rescue mission that had to be aborted after eight service members died in a sandstorm. The hostages were only released after Carter lost a bid for reelection. VIDEO: Iran-Iraq War The eight-year war between Iran and Iraq cost billions of dollars in damages and claimed millions of lives, but resulted in no real benefit to either side. Though American hostages were released just hours after President Reagan’s 1981 inauguration, the U.S. didn’t let go of its Iran sanctions. The U.S. had agreed to revoke all trade sanctions with Iran as part of the agreement that released the hostages, but didn’t immediately roll back all of the economic sanctions imposed by Carter. 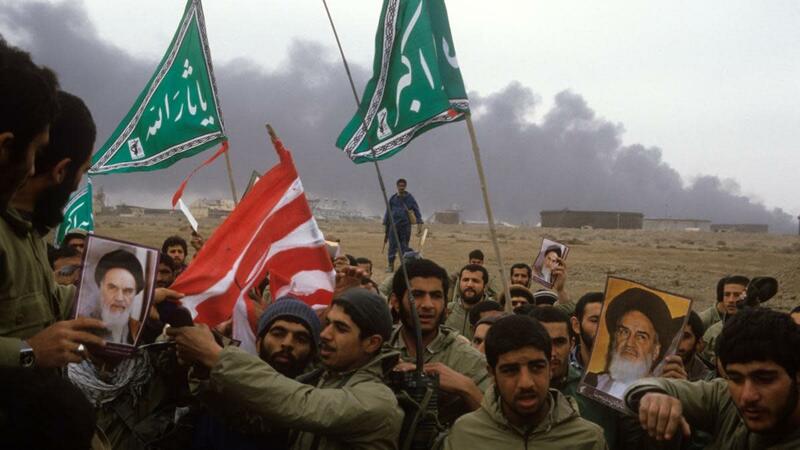 Meanwhile, Iran was invaded by Iraq in 1980, prompting an eight-year war. At first, the United States maintained a neutral stance. But over time, the U.S. began to support Iraq. In 1983, a truck bomb attack ripped through a Marine compound in Beirut, Lebanon, killing 241 U.S. service members. The Reagan administration suspected that Iran was at least partially behind the attacks, which were carried out by terrorists. This led the United States to designate Iraq as a “state sponsor of terrorism,” a moniker that gave the U.S. the ability to further sanction Iran. The designation halted loans and foreign aid; it also restricted sales of “dual-use items”—technologies and materials that could possibly be used for warfare in addition to their intended use. In public, Reagan continued a strong sanctions stance against Iran on the national stage. But behind the scenes, his administration officials were funneling money and arms to Iran in exchange for Americans taken hostage by Iran-backed terrorists in Lebanon despite the arms embargo—in what would later become known as the Iran-Contra Affair. Though the secret program wouldn’t become public until 1987, it secretly helped shape the Reagan administration’s policy toward Iran. In hearings about the scandal, Lieutenant Colonel Oliver North claimed he had participated in the arms deals with the full knowledge of President Reagan and admitted to moving funds from the Iran arms deals to the Contras in Nicaragua. However, Reagan denied that he had exchanged arms for hostages, instead insisting that he had participated in the program as a way to encourage “moderate” Iranians to support the United States. In 1987, the United States purchased Iranian oil for its Strategic Petroleum Reserve. Congress was appalled and scolded Reagan. Under political pressure, Reagan outlawed all imports from the U.S. to Iran. However, he painted the move as a necessary response to Iranian aggression. “We are taking these economic measures only after repeated but unsuccessful attempts to reduce tensions with Iran and in response to the continued and increasingly bellicose behavior of the Iranian Government,” Reagan told the nation in a statement about the trade embargo. VIDEO: What Was the Iran-Contra Affair? Learn about the Iran-Contra Affair under President Reagan who secretly supported an anti-Communist group in Nicaragua and funneled weapons to Iranian terrorists in exchange for American hostages. 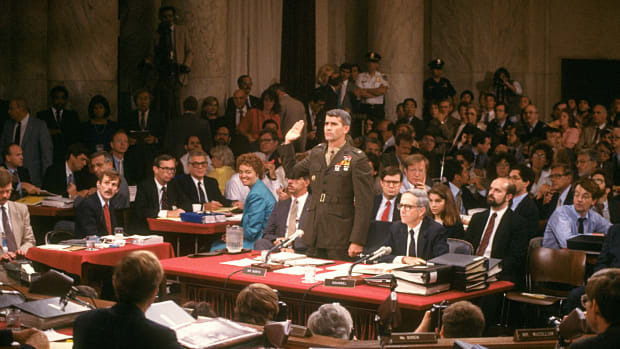 Discover how Lt. Col. Oliver North was found guilty. 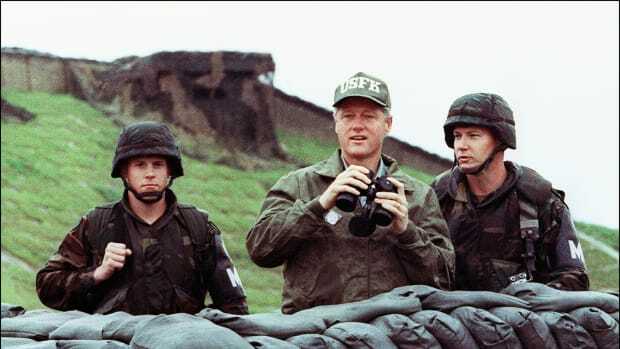 After the Iran-Iraq war ended, President Clinton developed a policy of “dual containment” designed to capitalize on the now diminished power of Iraq and Iran. The policy centered on what was becoming the most important geopolitical asset of the 1990s—the oil in the Persian Gulf. Since the U.S. could not overthrow Iran, Clinton’s administration decided to use oil to weaken it. In 1995, Conoco and Iran announced a $1 billion contract that would give the U.S.-owned company unprecedented access to two Iranian oil fields. The Clinton administration leapt into action, claiming the contract threatened national security. Conoco backed out of the deal and Clinton banned U.S. companies from participating in oil deals with Iran. This was further consolidated by the 1996 Iran and Libya Sanctions Act, alaw that called for the U.S. to establish “multilateral trade sanctions” against Iran. Sanctions against Iran were now the law of the land. 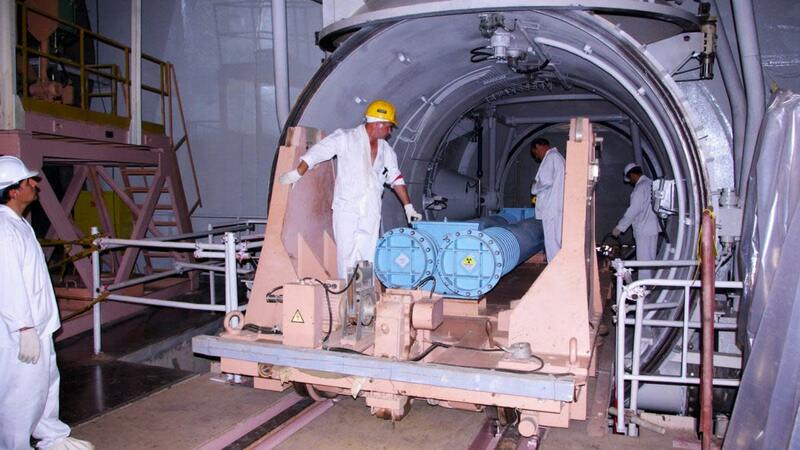 In 2002, the international community learned that Iran had been enriching uranium and was developing a nuclear program. 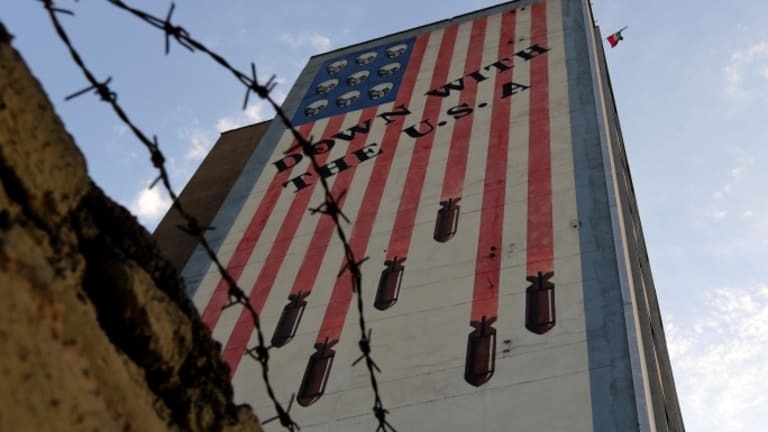 The United States had long suspected Iran of a covert nuclear program, and when President George W. Bush dubbed the country part of an “axis of evil” after the 9/11 attacks, relations between the two countries began to degrade. Soon, the U.S. was working to freeze the assets of individuals and businesses it suspected of aiding Iran. As the international community put pressure on Iran, the U.S. tightened the grip of its existing sanctions, enforcing them more vigorously and levying large penalties on banks and individual that didn’t comply with rigorous rules. Sanctions tightened even further under President Obama, who targeted Iranian petroleum purchases, banks, and automobile industries in response to Iran’s nuclear activities. Ultimately, the United States forbade almost all trade with Iran. It was joined by much of the international community, which levied significant economic and political sanctions. 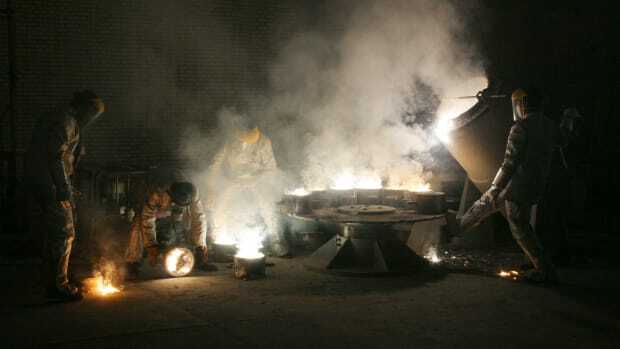 As a result, what was left of the Iranian economy tanked. Healthcare, banking, and other critical sectors suffered, and Iran’s currency, the rial, plummeted. Sanctions pushed up prices within Iran,spurring inflation and unemployment. The sanctions are “severely weakening the middle class, breaking the collective will and marginalizing democratic voices while solidifying the power of the ruling elite,”wrote Iranian-American filmmaker Beheshteh Farshneshani in the New York Times in 2013. These devastating effects only shifted once President Obama announced a historic pact that lifted nuclear sanctions in exchange for an end to Iran’s nuclear program in 2015. The deal gave Iran the ability to sell oil on international markets and effectively opened up the global markets that had slowly closed over decades of sanctions. With President Trump’s cancellation of the nuclear deal, sanctions against Iran will once again be instituted, as they have been for every crisis since 1979.